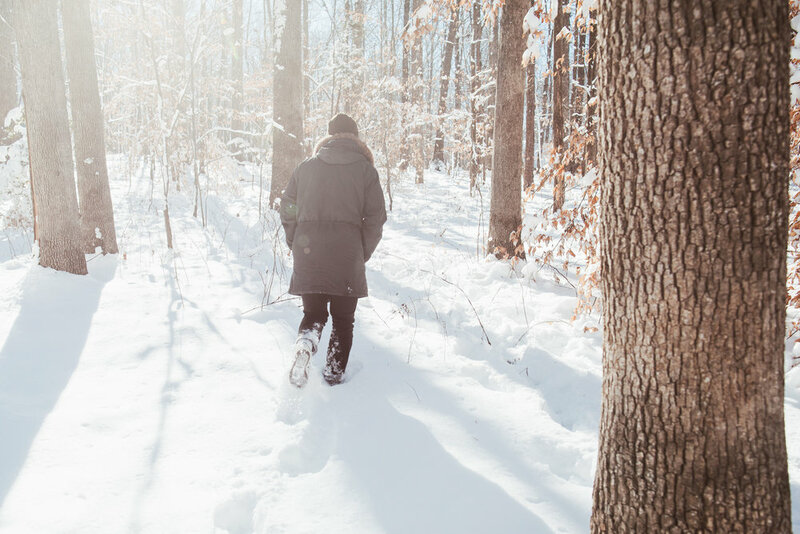 This week's Cultivate feature comes from Volume II : The Clarity Winter Brings. This issue of Cultivate is specifically designed to help you process winter seasons of the heart. Cutting Wood was written by Cageless Birds staff member, Jake Stevens. As the manager of the grounds at A Place for the Heart, Jake has learned to find the Father speaking to him as he works and tends to the land. Cutting Wood is an empowering piece meant to provoke you to engage the Lord in the tougher areas of your life and dream into the possibilities that He sees for you. As you read this piece, may you feel inspired to engage the fullness of what God has for you and to make powerful moves in your life. It felt like we were in another world, over there across the road. It was a massive tract of land that had been clear cut to sell off as lots full of acres. For weeks, JD Gravitt and I had the pleasure of gearing up most every morning to face the cold of winter to cut firewood for the farm. I am pretty sure those days of cutting, splitting and stacking are a huge reason we are where we are today. We might as well have been at war the way we talked. It felt as if we were eight thousand miles away on some distant battlefield. Talks of love and marriage, of growing old and of being real men filled our mouths and our ears as our warm breath filled the cool air. Those are important days in my heart, and if you asked JD, I am sure he would say the same. Even now, whenever there is an eternal moment that takes place, usually one of us will mention “those days when we cut wood” and say that it somehow made way for this present moment to happen, whatever the moment may be. Recently for each of us it was a wedding, getting married to the women of our dreams. Next it will be having kids, and then later being grandparents, I’m sure. I know I make it sound glorious, like we were in a war and we won, but in a way we really were in a war, and we did win. Those cold winter days couldn't contend with the fire that began to burn in our hearts as we dreamed about becoming the kind of men who would do anything for their wives someday. Along with the conversations, the victory was the work of our hands, it was being given a job and seeing it through to the end. It was having a good attitude and a good position of the heart. "CHOPPING WOOD WAS THE PERFECT PLACE TO PUT INTO PRACTICE WHAT OUR HEARTS WERE DREAMING ABOUT." We learned a lot about how to take initiative and make decisions over there. Most importantly, I believe a vision was cast in our hearts to become the men we heard about in stories and the heroes we saw in movies. Even more than that, we dreamed of becoming the kind of men who really made a difference, who were as bold as lions and confident and fierce in the face of our enemies. We dreamed of becoming men who could lead, protect and provide for the loves of their lives. We dreamed of becoming men of God. I would say that JD and I have both become those things and will continue to become those things till the day we breathe our last. Prompt: Those years ago, my battlefield was choosing to work hard and diligently in the cold cutting wood, wood that I might never use myself. Those hours of labor and choosing a good attitude set the scene for me to dream for my life. What battlefield are you avoiding in your life where the Lord wants you to dream something great? Sometimes the greatest victory is in your choosing to say yes to the Lord where you are at. There He will meet you and forge character in your heart and inspire you to become something great. Dare to say yes and become something and someone even greater than you already are! Write down your battlefield, and then repent to the Father for avoiding His fullness for you on that battlefield. Then say yes next time you’re out there and receive what the Father has!